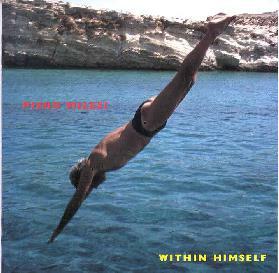 Piero Milesi - "Within Himself"
Within Himself is Italian composer Piero Milesi's fourth release on Cuneiform but his first in a decade. Milesi's music is primarily electronic, though numerous "real" instruments are used. The tracks are drawn from works over the last decade that Milesi created for films and various public festivals and art events. The music is strong on imagery and thematic development drawing on influences ranging from early 70's German electronic music, minimalism, and classical. Milesi has an interesting background. After having studied cello he moved on to study electronic and experimental composition and wrote his dissertation on the relationships between space and music. He is active composing music for films, television, ballet, theater, and art events and festivals. The opening track, "So Soggy", was my favorite. The music is performed by Milesi on piano, keyboards, and programming, and guests on fretless bass and cello. Such beautiful sounds come from the simplest notes produced by a fretless bass. The piece opens with a somber piano melody accompanied by sparse but effective bass notes. The cello soon takes over kicking off a more spirited pace, playing a Philip Glass styled minimalist pattern. The cello is aggressive and intense, but Milesi's keyboards and piano soon join in to return us to the melancholy atmosphere that opened the piece. A subtle work with the emotional impact of a full symphony. Another standout track is "Avanti La Tre". From the Italian indie film Passagi, this track makes equal use of music and sound effects including voices, trains, bells, and much more. The sounds of a busy urban landscape alternate with a lightly dancing ballet-like symphony. The flow between these seemingly contrasting themes is unexpectedly smooth and natural. "Dentro Di Sé" is a duo of Milesi on piano, keyboards, and programming and a guest on cello. Repetitive but pleasantly melodic keyboard and piano lines are embellished by mechanically electronic sounds that seem to be trying to impose their will where they would otherwise be out of place. I liked the contrast and combination of the simple melodies and the harsher blasts of somewhat dissonant electronics. On the more "New Agey" side are "Volti Riflessi" and "Fuochi Sul Tevere". "Volti Riflessi" features layers of floating symphonic keyboards accompanied by various percussive bits. And "Fuochi Sul Tevere" is a Vangelis styled symphonic piece with only Milesi on keyboards and programming. Nice music but these these two didn't grab me like the other three did. Overall, I can see where Milesi might be well in demand for soundtrack work as I really enjoyed the image inducing quality of his music. The music on Within Himself was interesting on the first couple listens but grew on me slowly with subsequent headphone treatments. Fans of Philip Glass and anyone liking a more composed feel to electronic music would enjoy Milesi's work. For more information you can visit the Cuneiform Records web site. Contact via snail mail at Cuneiform Records; PO Box 8427; Silver Spring, MD 20907-8427.